7:00 pm -- "The Bright Forever" starring Bobbie Curtis -- Valleytown Cultural Arts Center in Andrews, NC. A one-woman show written by Gary Carden and performed by Bobbie Curtis. Fanny Crosby, the character that Bobbie portrays was blinded at six weeks of age by an incompetent doctor. Despite this handicap she wrote over 8,000 hymns and an equal number of poems. Almost every hymn book in use today will contain one of her hymns. In her lifetime she was one of the best known women in the United States. Her sacred songs were sung wherever the English language was spoken. She became a student at the first school for the blind, in New York City, at the age of fifteen. After receiving her education, she remained at the school for 28 more years as a teacher. One of her fellow teachers was Grover Cleveland who later became President of the United States. Never one to bemoan her blindness, her poetry expresses her joy of living. Bobbie Curtis of the Foothills Little Theatre in Lenoir, N.C. will play Fannie. Bobbie grew up in eastern Caldwell County, NC. The tenth of eleven siblings. Born in the depression era, she longed to be an actress. But, money was a big issue and she was told that none was available to explore whimsical dreams. Pursuing a more practical career, she became a nurse at Grace Hospital and later in the field of public health. Now at the age of 75 she is realizing her dream of being an actress, playing to full houses and receiving accolades. The following review of the one act play Birdell, is from The Messenger, and written by: Jaine Treadwell. Published Jun 07, 2008 - 20:06:32 CDT. Bobbie Jaynes Triplett Curtis, a 75-year-old mountain woman, who is much like the octogenarian that she plays, will perform "Birdell". "I have a garden with summer vegetables and, last year, I couldn't find anybody to plow it for me, so I took a mattock and dug it by hand," Curtis said. When Curtis saw "Birdell" for the first time, she was so taken with the character that she had to play her. "She is the most fascinating character that I have ever played," said Curtis, who has recently begun performing the role of Fanny Crosby, the blind hymn writer. "I feel that I'm really in Birdy's shoes and that I have been there." 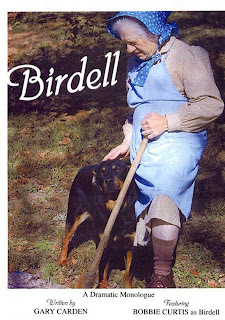 Birdell is an 86-year-old Appalachian woman who has spent way too much time alone and she is a little crazy.She sits on the porch and listens to the rain crows, naps and dreams of when she had a family that sang on the porch in the moonlight.When the play opens, 'Birdy' is in her front yard trying to kill a snake. She looks up to see the audience, which she takes for a crowd of people trying to buy her land. She immediately begins talking and, for the next hour, she recalls her entire life, including her marriage to a man named Westley who has been known to "stretch the blanket" and make his share of moonshine. Steed said all eight members of the BHS storytelling committee read the script and fell in love with it. "'Birdell is the story of a woman's life in a cabin in the Appalachian Mountains," Steed said. "But 'Birdy' is much like the women of strength and character of the rural South during the Great Depression. She is one of us. She'll make you laugh and she'll tug at your heartstrings. She is Birdy, plain and simple." NCWN West and The Learning Center are sponsoring Birdell on September 19, 7:00 PM at the Learning Center in Murphy.Tickets are available in Murphy North Carolina at Curiosity Shop Books and at the Murphy Library. $12.00 adults and $6.00 for children. Call 828-389-4441 to order tickets by mail.